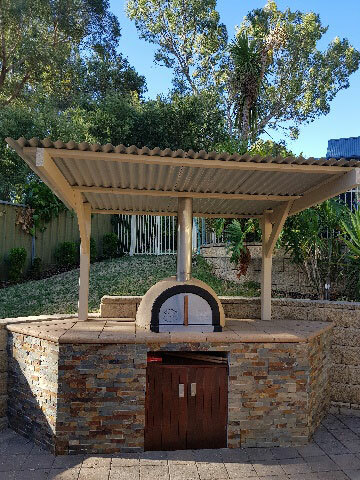 The oven is designed to reduce smoke escaping from the front door entrance, this is done by placing the chimney slightly inside the dome area, allowing the smoke to escape more easily. Reducing the amount smoke that some other ovens release. 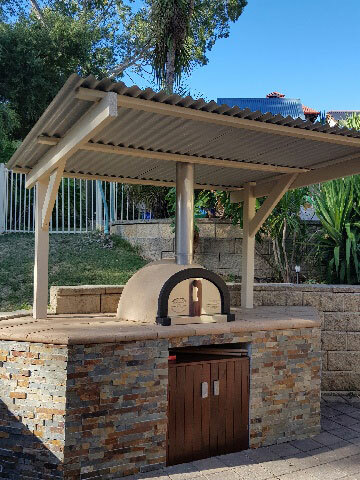 These ovens are hand made in by Indoor Outdoor Kitchens. Special attention in the construction of these ovens is taken to produce a quality product. These are as listed below. • The dense refractory concrete use in my ovens has been designed to with stand the demands of heating and cooling to reduce fractures to a minimum. Approximately 90% of the materials used in my ovens are manufactured in Australia. I do not use cheap refractory materials from China. • The concrete is reinforced with stainless steel reinforcing needles were most other imported and ovens made in Australia ovens have none. • The internal of this oven is designed in two halves to reduce thermal stress due to expansion. • The efficient design and extensive use of two insulation materials one being 13mm high temperature super wool ( total thickness 50mm) The other a ridged insulation which is also reinforced with Alkaline fibreglass fibres where most other ovens have none. This makes using this oven economical and easy to operate, with it ready to cook delicious pizzas in approx 45 minutes. • Please be aware of other ovens with hearth tile sitting on insulation blankets. • 150mm standard size stainless steel with a combustion cap is supplied not a standard cap. As seen in the gallery it is not just a pizza oven, it cooks unbelievable roasts with its large door opening allowing it to take a large camp oven, this also adds to the ambience of the night being able to see the fire.